Join Bishop Mariann, Bishop of Washington, on an 8-week journey of experiencing Jesus through a rule of life known as The Way of Love. 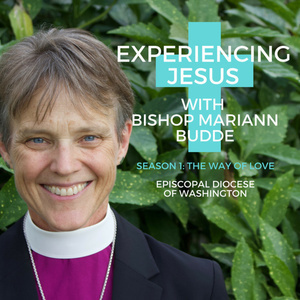 Bishop Mariann will share with you an 8 part sermon series on how experiencing Jesus through intentional spiritual practices will transform you and those around you. Bishop Mariann explores three ways that the practice of blessing can draw us closer to God and help us grow in our capacity to love. It seems as if we all must wrestle with things in life--hard things we would not choose but have come to us nonetheless. We must wrestle with them until the blessing reveals itself. That’s not to say that we are to pretend to feel the blessing when we don’t, to sugarcoat something terrible, but rather that we allow ourselves to receive blessing in our time of trial, however it comes. It could be the blessing of a hard-won truth; or a capacity that’s grown in us because of our experience, a gift that sustains us through our ordeal. We would never wish what we have gone through on anyone, and yet the blessing, when it comes, is often enough for us to be grateful for the person we’ve become as a result of our trials. That is the miracle, the power of blessing. The Way of Love is the journey of a lifetime. It’s a way of knowing God, receiving and sharing Jesus’ love, and being a blessing to the world.